Your trusted source for Original Manufacturer Zero Turn Mower Parts and New Mower Sales. When any old mower won’t do, a high-quality zero-turn mower will get the job done. Enjoy pinpoint precision coupled with serious power for a cut so close around obstacles it nearly eliminates the need for trimming. The zero turn’s meticulous mechanical controls are designed to let you stop on a dime and effortlessly navigate any turf. Zero-turn lawn mowers are a popular choice for commercial use because of their ability to save you time with their power, speed and delicate maneuverability. Small Engine Parts - Original Parts for Zero-Turn Mower Engines | Need a New Engine? Call for assistance and we will get you set up. 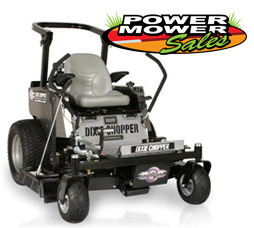 Power Mower Sales is your Zero-Turn Mower Superstore! We carry all the top Lines and latest Models. Shop the latest equipment at lower prices, and take advantage of our comprehensive customer service. Power Mower Sales also supplies OEM accessories and replacement parts for all brands and models of zero turn mowers. Shop our assortment of lawn mower blades, belts, filters, wheels and much more. Use the links above to guide you to the proper parts diagram in our Zero-Turn Mower Parts Lookup to find what you need. If you already know your part number, use the quick search bar at the top right to find it fast!